Following the death of a family member or loved one you may feel overwhelmed, not only emotionally, but by a host of legal requirements and uncertainties. The professionals at Puget Sound Probates are here to counsel and represent you throughout the post-mortem administration process. Often, that involves probate. Technically “probate” means proving that the original Last Will and Testament of a decedent is just that and the person named in it to serve as Personal Representative of the decedent’s estate is entitled to be issued Letters Testamentary by the court. But more broadly it describes the procedure for an orderly court-supervised administration of a decedent’s estate in a manner that assures the decedent’s intent is carried out and the interests of the decedent’s spouse, family, heirs, beneficiaries and creditors are protected. Upon death, a person’s estate must be addressed. When someone dies without a Last Will and Testament, we describe the estate as intestate and the person appointed by the court is called an Administrator. The residue of an intestate estate is distributed to the decedent’s heirs, determined by law. If you are in possession of a decedent’s original Last Will and Testament the law requires you to file it with the Superior Court within 30 days after learning of the death, regardless of whether it needs to be probated. Often clients come to us after a financial institution tells them it cannot even provide information regarding assets of the decedent unless they obtain Letters Testamentary (or Letters of Administration where there is no Will). The professionals at Lyons Sullivan can work with you to first determine whether or not it is necessary to dive into the probate process and initiate a proceeding. The determination will depend upon how the assets and accounts of the decedent are titled and, where there is a surviving spouse or registered domestic partner, whether there is a “three-legged” community property agreement. Assets that do not pass through probate include what we term non-probate assets, assets held by the decedent in a revocable trust and assets passing under a community property agreement to a surviving spouse (all discussed below). Most Wills provide for the Personal Representative to serve without posting a bond and with “nonintervention” powers. The latter significantly reduce the expense of probate by enabling the Personal Representative to administer the estate almost entirely without court supervision, so it is unnecessary to pay an attorney to request permission from the court every time something has to be done. When granted we usually file a simple Declaration of Completion with the court at the end. In intestate estates or testate estates where no provision is made for waiving a bond or granting nonintervention powers there can be additional expense. The Administrator or Personal Representative may need to advance the expense of the bond premium in order to obtain Letters Testamentary. Sometimes this can be avoided if most of the liquid assets are deposited into a blocked account requiring a court order to access. Right after appointment a Personal Representative obtains an Employer Identification Number (EIN) online from the IRS. 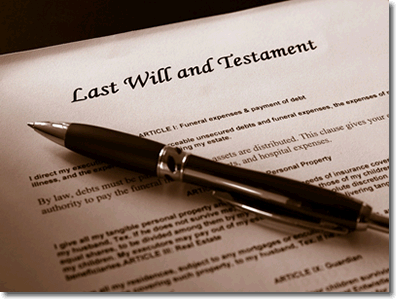 Upon death, an estate or revocable trust becomes a separate taxpaying entity. All income is thereafter reported by financial institutions under the EIN rather than the Social Security Number of the decedent. An EIN is necessary to open estate or trust bank accounts and to file a federal fiduciary income tax return on Form 1041 for the estate and/or trust (an election can be made on the online application to elect to treat a probate estate and formerly revocable trust as a single taxpayer). The estate or trust pays income tax on income it realizes, but receives a deduction for certain types of income actually distributed out to beneficiaries during the year. The Personal Representative will need to secure Social Security numbers of the beneficiaries before making distributions, so that the tax return preparer can report distributions of income to the IRS. A determination should be made immediately as to whether the gross estate of the decedent is required to file an estate tax return with the IRS and/or the Washington Department of Revenue. The threshold for federal filing is more than $5 million in lifetime gifts or estate value. The threshold for filing with Washington State is $2 million per estate.